It would be hard to find people who finds creating status reports fun and enjoyable. It is especially hard for middle managers and project managers who needs to collect reports from a team and present to higher management. At the same time it would be hard to find any manager who would say status reports are not useful. 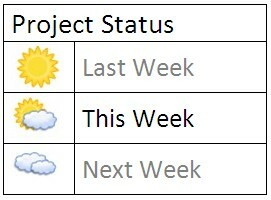 It helps to keep all stakeholders up to date on the latest status in the organization or project teams. This general awareness of all the happenings in the surrounding improves transparency, motivation and better appreciation of one’s own work and fosters teamwork. It should be circulated as widely as possible and not only to higher management. It helps team members learn about the status and progress on work that they depend on and if needed add comments and suggestions. It helps management to track health of projects, identify red flags early and help to resolve or mitigate the most important issues. Last but not the least, while we are always focussed on the remaining work for the immediate future, status reports provides a forum to review and celebrate the accomplishments of the recent past. One can never underestimate the joy of getting things done. It never hurts to relish those green colored tasks that just got completed. Creating a good status report is a skillful task. Different consumers might have different expectations. A good status report must allow the reader to get the big picture and then if needed drill down to the details of specific items. It should allow readers to identify issues easily and enable them to discuss and brainstorm these with the right team members and come up with solutions or mitigation steps. Additionally visual aids go a long way in quick and accurate comprehension of the report. Standardization of format, language and color codes also improve the readability of the reports. The Wizergos Daily Standup Meeting and Weekly Program Meeting workflows automates status reporting and removes the tedious work of creating status reports. This allows team members to instead focus on the intelligent aspects of finding solutions or mitigations for important issues. Try Wizergos to see how it can help create a more enjoyable workplace.